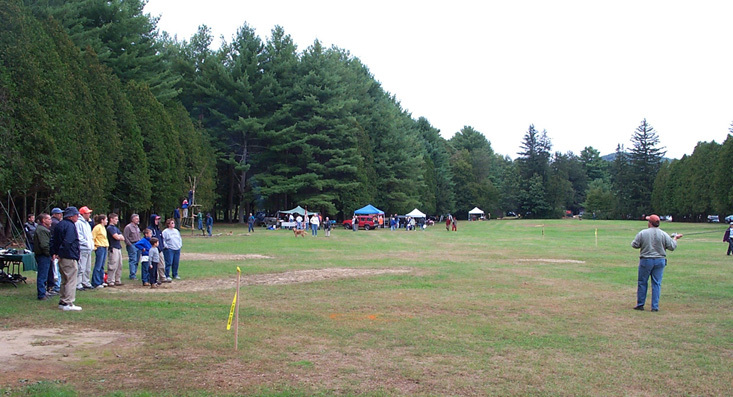 People's Forest in Barkhamsted was a busy place on Saturday, October 4, 2003. A huge celebration to recognize Connecticut's Forest Centennial was the occasion, filling the pavilion and stretching a quarter mile up the field with exhibits and displays. 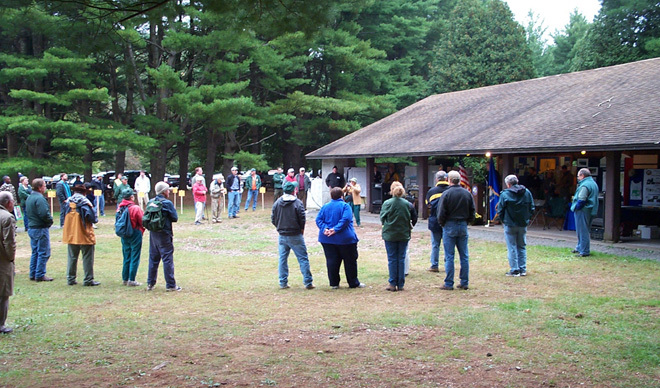 This event at People's Forest was the primary location in the State for the activities honoring 100 years of Connecticut State Forests. This year (2003) is the 100th anniversary of the purchase of land that is now Meshomasic State Forest. This is not only the first State Forest in Connecticut but in all of New England, and the second state forest in the country. Meshomasic State Forest is in Portland and now covers about 50 square miles. 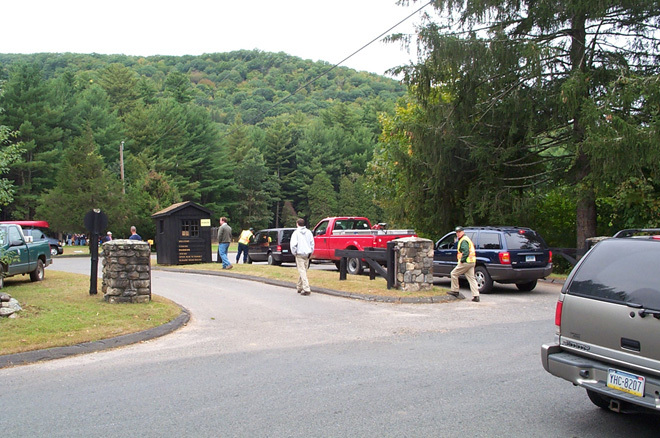 Photo above left- the busy entrance gate at People's Forest on October 4, 2003, the day of the Forest Centennial. Above right- forestry displays at People's Forest pavilion. It should also be noted that on this same day (October 4) in 1924, the big pageant and dedication for People's Forest was held. About 3,000 people attended that event and watched Governor Templeton accept a deed for the first 650 acres of People's Forest. Today, three state forests (Peoples, American Legion and Tunxis) make up about 20% of Barkhamsted's land area. 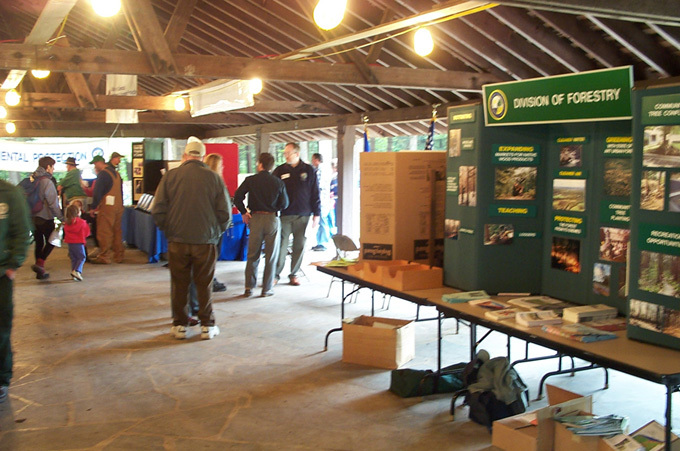 The day's activities kicked off at 8:30 a.m. Exhibits and demonstrations were set up by many organizations including the State Department of Environmental Protection, Connecticut Forest and Park Association, Kellog Environmental Center, Barkhamsted Land Trust, Barkhamsted Historical Society, Metropolitan District Commission, Connecticut Woodcarvers Association, Farmington River Coordinating Committee, Northwestern Regional 7 vo-ag department, Connwood Foresters, the Trust for Public Land and the Farmington River Watershed Association to name just a few. At midday, a special ceremony was held with words from several notable speakers including Deputy DEP Commissioner Dave Leff, State Forester Don Smith, State Senator Andrew Roraback, Congresswoman Nancy Johnson and Civilian Conservation Corps (CCC) Alumnus Walter Saville. In his talk, Don Smith pointed out that citizens of Connecticut currently own 149,000 acres of State Forest land which provides a wide range of recreational opportunities, cleaner air, more pure water, and quiets the noisy world around us. He noted that those who came before us had a vision regarding the State forests and we are carrying that forward with a century long tradition of careful stewardship. 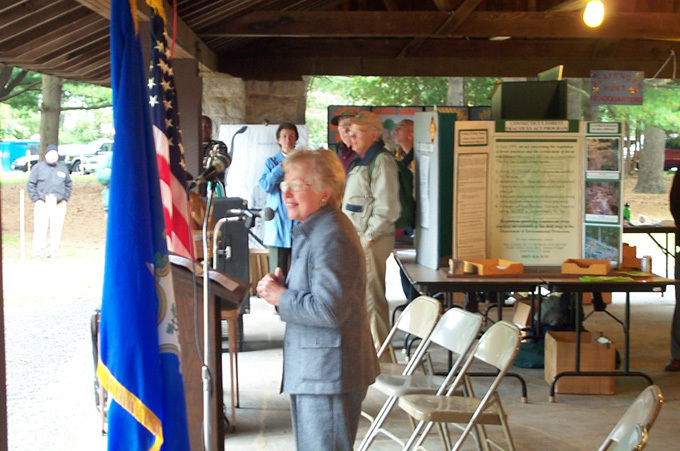 Nancy Johnson noted that without enlightened forest management we would not have the resources to support the people of Connecticut. Walter Saville, a former Civilian Conservation Corps member, spoke on some of the history of the CCC program from 1933 to 1942 and presented Pam Adams and Marilyn Arristad with awards recognizing their support for Connecticut forests and preservation of CCC history. 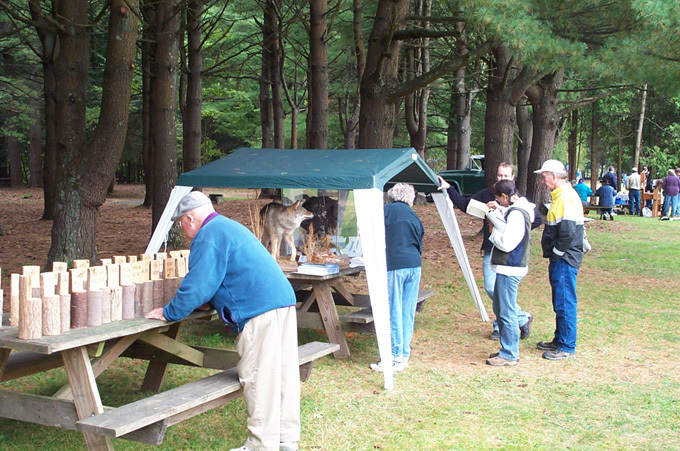 The Barkhamsted Land Trust was kept busy at their food booth feeding the people at lunchtime. Clouds and sporadic rain held down attendance for the events during the day but those who did attend were treated to many educational and enjoyable activities. Photo above left- the Metropolitan District Commission exhibit included a wood sample display and mounted forest animals. Above right, a fly fishing demonstration. 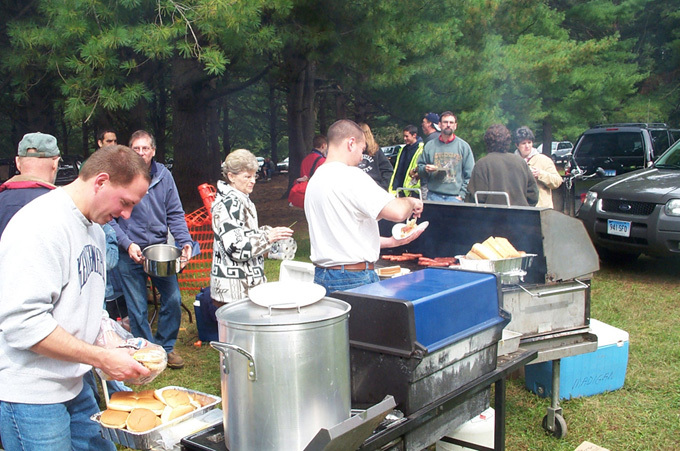 Photo above left- the Barkhamsted Land Trust food booth keeps the multitudes fed during lunch. Photo at right- visitors gather for the ceremony and speeches. 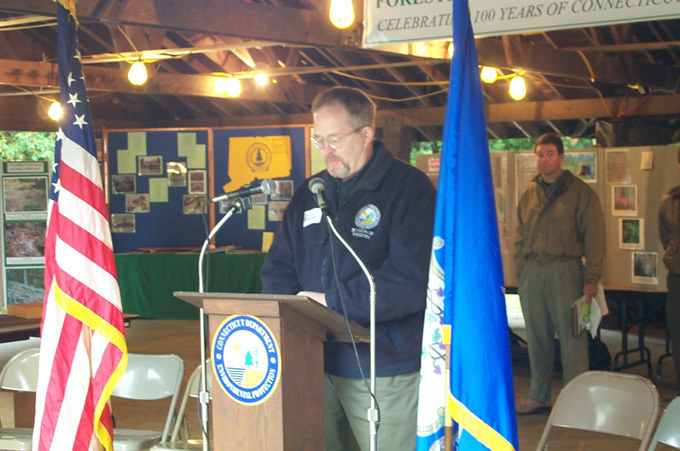 Photo above- State Forester Don Smith talks about 100 years of forestry in Connecticut. At right, U.S. Congresswoman Nancy Johnson speaks to the crowd.